Lamberson was a player on the AVP, FIVB, BVA and WPVA pro beach volleyball tours from 1992-2005, competing in 178 career tournaments. She earned a fifth-place finish at the 2001 FIVB Beach Volleyball World Championship in Austria with Danalee Bragado-Corso and was voted the BVA�s Top Server in 2000. 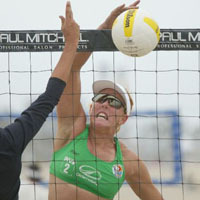 She has four pro beach final four appearances to her credit and ranks ninth in all time tournaments played. Since her retirement she continues to play on the CBVA and EVP tours. Lamberson has been involved with indoor club volleyball since 1999, first as a coach and coaching consultant for South Bay Volleyball Club, and currently as the Head Coach for Starlings LA West which she founded in 2004. From 2001-2005 she was head coach of the Cal State University Dominguez Hills (NCAA DII) women's volleyball program, leading the Toros to one of their best seasons to date and their first-ever Regional Ranking in 2004. From 1998 to 2005 she also ran a series of successful adult volleyball classes, The Indoor Intensity Clinic and The Beach Intensity Clinic. Lamberson was UC Irvine�s top outside hitter (1986-89) where she was a 1989 First Team All-Region Selection and lead the �Eaters to their first-ever NCAA tournament appearance and top 20 ranking in 1988. A three-time Scholar Athlete award winner and the 1990 Senior Scholar-Athlete of the Year, she graduated from UCI in 1990 with a bachelor's degree in English, and spent one season as a middle/opposite with Vfl. Oythe in Germany�s Bundesliga. She earned her master's degree in behavioral science (negotiation, conflict resolution and peace building) from Dominguez Hills in 2003, where she currently teaches a graduate level course on Dispute Resolution for Sports. In 2005 Lamberson was certified as a trained mediator by the Los Angeles County Bar Association.